Meantime, here is one quilt top I've just finished and a new project I am loving so far. so I started this weekend with these slightly wonky improv blocks . . . I made a couple of 10" trial blocks and it all just started to grow from there. It's been a while since I've used solids in my quilts, they called for some careful pressing. There is a great post on pressing seams here if you are like me and need a little reminder. I rotated the quilt a few times, just to check it looked balanced from every angle - a little trick I picked up recently from Kaja at sewslowly. Well this sure brightens up a dull day. And up on my design wall this week . . .
my new scrappy WiP "ebay on point"
It's great to be using so many of these fabrics from my scrap basket. The pattern is simple, however I'm finding to get that all important 'contrast' thing-y happening, I am having to juggle bits & pieces around until it's just right. And I'm really trying hard "not to analyze the fabric for its beautiful design but rather, consider each only for its colour." It's taking me awhile, and thank goodness for the design wall, just wish I had heaps of squares all precut, ready to stick up there, reject, replace . . .
but I'll let you know how it does go. It was a well constructed and colourful quilt top, a version of Kaffe's 'Fonthill Quilt'. Here's a few close-up pics, there's so much to look at. Like that lovely 'cheddar' yellow for starters . 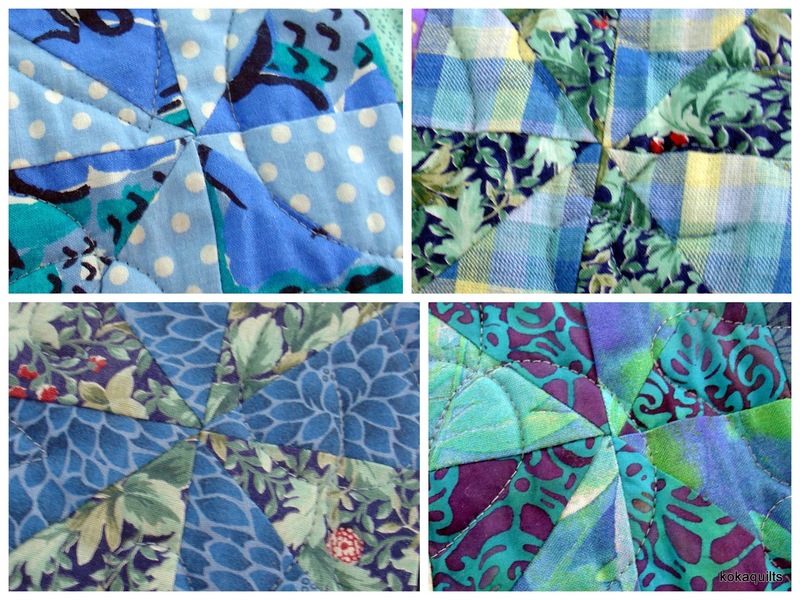 . .
the different blue fabric combos . . .
and the little 'pops' of minty green . . .
this unexpected softer pretty yellow print . . .
all those small 2" HST piecing in the centre panel . . .
and the assorted traditional pinks & purples . 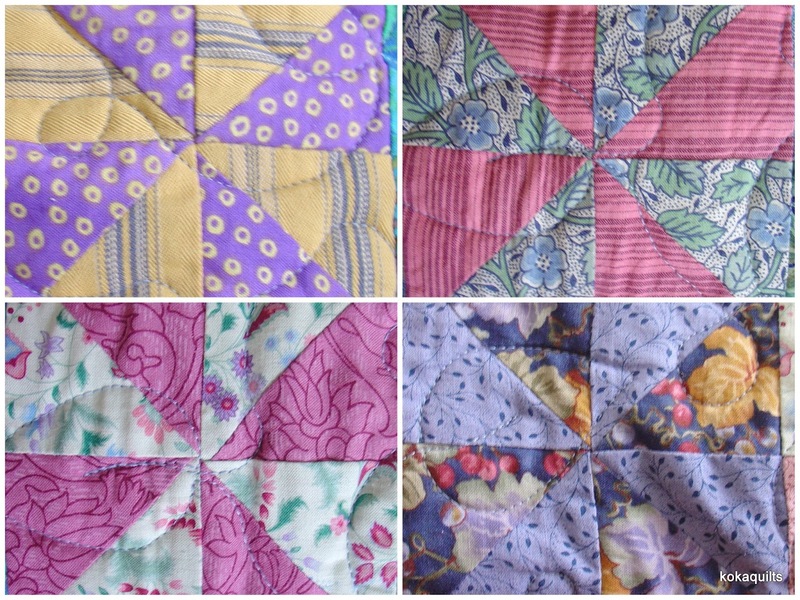 . .
do you have an old-ish quilt that you can't bear to part with too? the Western Quilters Circle Annual Quilt Show here in Auckland NZ. and so great to catch up with quilters I hadn't seen for a while . . .
and a second version in a different colour scheme, using a Kaffe cabbage fabric . . .
with a pretty display of their latest Tilda fabrics . . .
and Cheryl from 'all things patchwork' had a colourful display . . .
and Kerryn from the country yard up near Whangarei had a great display too . . . I'll leave you with a few pics of my favourites from the show . . .